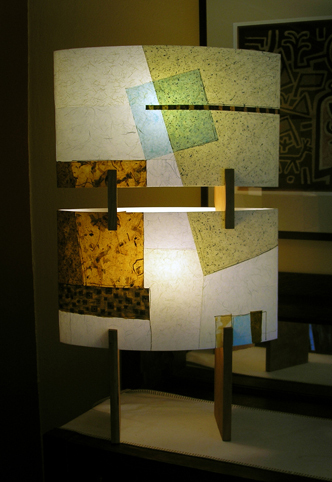 For those who are new to the site, my lamps are individually crafted creations of fine art papers and fine hand-finished woods that are both functional and esthetic—distinctive in the home, office or as gifts. The moods they evoke can accent a dark hallway or enliven a neglected area of a room. I’ve been making the lamps for five years now. I’ve learned a lot but also feel the need to start exploring other mediums and moving my art to the next step. Not sure where it’s going. In 2010 I may be even harder to find in terms of art fairs. I guess you could say I’m taking the year off and concentrating on my graphic design business. Sometimes it just gets down to making a living. I don’t have a big inventory these days but if you have an interest in one of the designs give me a call and I’ll let you know what I can do. I also have some lamps on Etsy under thelampguy. It’s not always easy to find me so here’s a link. I offer the Step and Curve styles in pre-selected wood and paper combinations, and I also will make them to your order using an array of papers from all over the world. I am currently offering a SALE PRICE on all Curv lamps as long as they last. Check it out. If you’d like to know more about me you can check out my blog called “The Lamp Guy". It shows many of my interests and influences. It’s really just for fun. You need a cool lamp for your cool house.